I thought I should blog about knitting for a change. 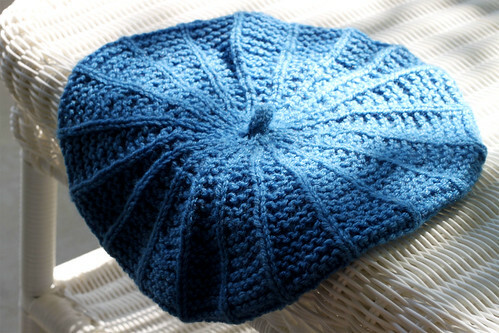 Here is a two needle tam. I used this pattern when teaching beginners how to knit, since the shaping is done by decreases alone. The last four stitches are done as I-cord for the top thing. The seaming is almost invisible because two stockinette stitches are pulled together forming one. If not knit too tightly the garter stitches make the hat floppy even in acrylic yarn. This entry was posted on Monday, August 17th, 2009 at 3:00 am and is filed under Knitting. Tagged: Knitting. You can feed this entry. You can leave a response, or trackback from your own site. What a great project! I love the Icord at the top!